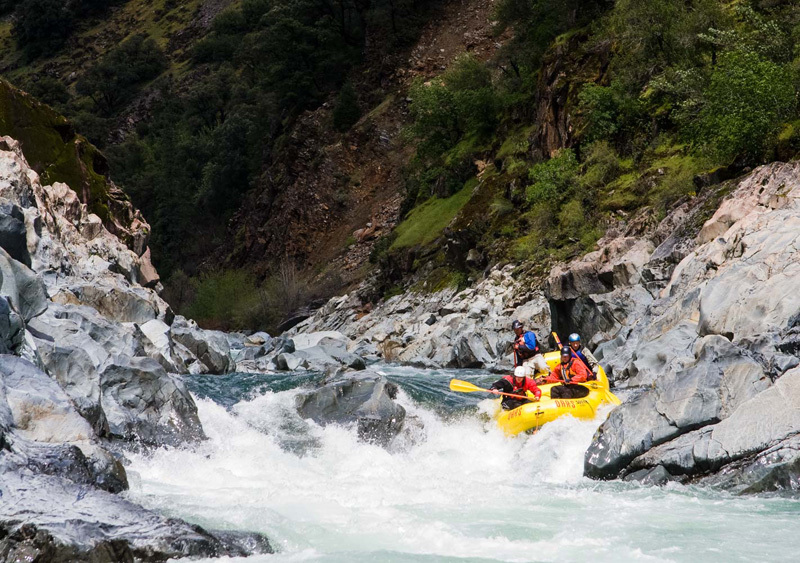 The North Fork American River offers some of California’s best whitewater rafting each spring during peak snowmelt. With its headwaters originating at the relatively low elevation of 8,500 feet, this spectacular run can be over in just a few short few weeks, or last into early summer depending on the depth of the Sierra snowpack. Your best bet is to catch it early—typically April to early May—before those elusive spring flows disappear for the season. Protected as part of the National Wild and Scenic River System, 38 miles of the North Fork American River flow freely, undammed through a pristine and remote wilderness. The river’s crystal clear, green waters gush through a narrow, boulder-strewn gorge, in between stunning 2,000-foot canyon walls dotted with black oaks and pine. Not to mention, experiencing the North Fork in the spring means wildflowers are in full swing, adding brilliant bursts of color throughout the canyon. Compared to the wildly-popular South Fork American River, it’s a place of spectacular beauty and solitude. The North Fork’s untamed spring runoff offers some of the best action-packed Class IV whitewater in the Sierra Nevada at a steep gradient of 41 feet per mile. Right out of the gate, you’ll drop into exhilarating rapids such as Slaughter’s Sluice (IV) and the 8-foot drop of Chamberlain Falls (IV+). As you catch your breath allowing your heart rate to slow, you’ll glance upstream and realize the intensity of the river canyon you have just entered. Downstream, over the next five miles, the rapids flow one after another in quick succession culminating with heart-pounding Bogus Thunder (IV) and Staircase (IV+). Finally, the river eases up, offering a pleasant stretch of Class II/III rapids and the opportunity to soak in the last of the canyon’s scenery and recount the day’s adventure. If you’ve rafted the South Fork or Middle Fork of the American River before and wondered what your next whitewater adventure should be – this is it. 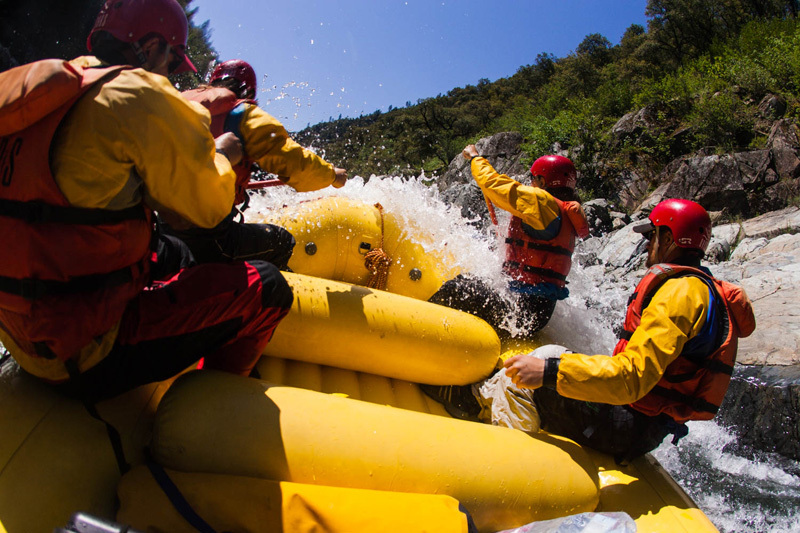 A North Fork American River rafting trip offers the most technical, action-packed whitewater of the three forks of the American River and is also uniquely different than the pool-drop style of many of California’s commercially-rafted rivers. This adventurous whitewater trip requires crews to work together as a well-oiled machine and perform a ballet on the water, maneuvering rafts through narrow boulder slaloms and steep drops as huge, icy cold waves splash you in the face. It’s peak thrill-factor. It can be hard to sneak away from the hustle and bustle of daily life. But if you’re in the Bay Area or Sacramento regions, a North Fork American River rafting trip is the perfect one-day adventure and respite from your to-do list. Trips meet just off of I-80 in Auburn, which is an easy 40-minute drive from Sacramento and just over two hours from San Francisco. You’ve likely passed this secret whitewater playground unknowingly on your way to Lake Tahoe. This time, when the snow starts to melt and the powder days are over, head up for a different type of adventure with your crew and experience the Sierra like never before. You’ll be off the river in time for a few celebratory beverages and dinner.